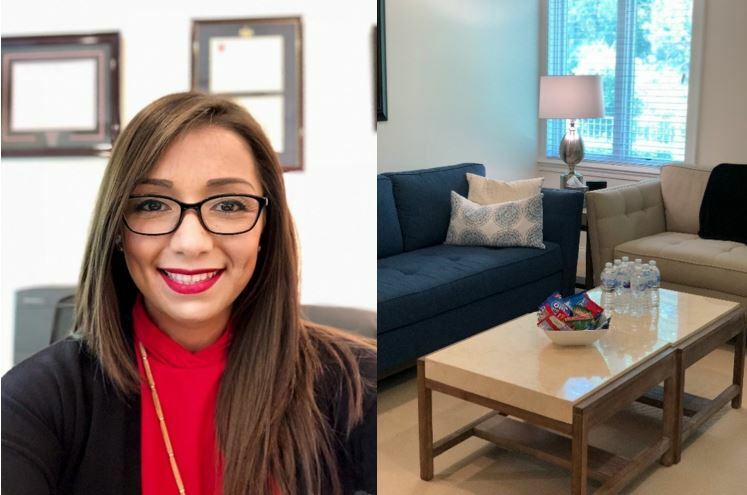 We sat down with Priscilla Cote, a Licensed Professional Counselor, with Carrera Counseling Services, who leases office space in The Woodlands, located at 10210 Grogans Mill. Tell us about Carrera Counseling, what type of services do you offer? I’m a psychotherapist and I offer individual counseling sessions for people who are experiencing depression and anxiety, but I specialize in trauma. I really enjoy working with people who suffer from post-traumatic stress disorder, acute stress, or have been through a recent traumatic experience. I work with children age 12 through adults. What would you say differentiates yourself from others, or how you work with your customers? In graduate school we’re taught a lot about theories and just mental health interventions, but I feel you can know all of the text book knowledge in the world, however you still have to have the art of connecting with people. I feel that I can very easily establish rapport with people and offer a lot of understanding and get to know people on a personal level. It happens very quickly, we build therapeutic alliance fairly easily. It’s me! I’m a one-woman show! I do my own billing, admin, and the therapy as well! But I’m looking to grow and bring on an administrative person so that I can focus on my core business of helping people. What is the history behind your business and how did you get started? I knew, from a very young age, that I wanted to be in Psychology. I didn’t know what it was called but I always had this interest in other peoples’ stories, hearing how people become themselves. I took my first class in Psychology and from then on knew this was what I wanted to do. As I progressed down this path, I had a professor who mentored me and helped me get through some of the anxiety I had getting out into the world and leaving home. She inspired me as I entered this helpful profession. When I went to graduate school I decided to go somewhere totally different, so I moved to New Jersey which was a big culture shock. And navigating the world on my own taught me a lot about myself and culture. There, in New Jersey, I realized how much 9/11 had effected that area and how people were still dealing with significant loss. After that, I got married and my husband was in the military, he was a Green Beret, Special Forces so we moved to Fort Bragg, NC and I became very involved with military families, veterans and all of the trauma that comes with being in the military. This experience just showed me more that Trauma Therapy was the area I wanted to focus my career on and, since then, I’ve helped people dealing with traumatic experiences. The experience can vary, depending on the client. Some want a very direct approach with structure, worksheets, and scientific basis, but what I’ve found is that most people just want to be understood. So, I really do a lot of listening, especially in the beginning, as they tell their stories, while getting to know them. I ask them a lot about themselves. And then I offer areas where they can intervene, changes that can be made and different thought processes that are then applied outside of the office. How do you maintain your customer flow? When I moved to Texas, I had been doing private practice for a while in North Carolina, but what I did to get started was I visited a lot of doctors’ offices, I introduced myself and told them about my services. I made myself available if any of those physicians felt that their clients’ needs were more behavioral or mental. After Hurricane Harvey, when we moved to The Woodlands, I sent packets to the physicians and hospitals in the area. I also market my business on Psychology Today, which is for therapists, and also through Google Adwords, which has been fairly successful. How long have you been a tenant at 10210 Grogans Mill? I moved here right after Harvey, because my previous office flooded. So I moved in here at the beginning of September. How did you find your current office location? I live in The Woodlands, and my previous office was in another part of town, but after Harvey hit and I had to move, I decided one of my requirements was to find office space in The Woodlands. So when I began looking, I actually found Boxer Property online and initially, when I saw the property photos online, I thought it was going to be out of my price range, because the building just looks so nice. I scheduled a tour on a whim and thought, what would it hurt to tour the space? Then I met Shenea, who is the Property Manager and I just felt like this was the right place for me. The property is so tranquil and every client that comes in and says: whoa! This does not look like an office building, it’s so peaceful and zen, which works perfectly since I need my folks to get to a calm place. I have really enjoyed officing here, Shenea is so great and it’s such a beautiful location. I can’t imagine having to ever move. How has your experience been at 10210 Grogans Mill been so far? My experience has been really, really good, as far as responsiveness goes all my questions are answered and my needs are met. I’m very much about human relationship, so every Boxer person that I’ve interacted with has been really sociable and warm. Although it’s a very corporate feel, I feel that I can really connect with the staff. To wrap up our conversation, let’s talk about the future, What is a top goal that you have for your business this year? I’d like to grow my practice to where I need another office. Honestly, I’m probably already there but I don’t need any more responsibilities than what I have on my plate right now. I’d eventually like to get to a point where I can hire someone to do more of the administrative work and billing, so that I can focus on my core services.